My CanSaveCarbon drinks can litter-picking challenge will generate 30kg of aluminium drinks cans, assuming I reach my target of 2,000 cans. Once the cans are recycled this will save 270kg of CO2 – over ¼ tonne. But what does ¼ tonne of CO2 look like? Is it the size of a car, a house? Or as big as a football stadium? Can you see it? We can see CO2 in its solid state as dry ice, and are familiar with the clouds of ‘mist’ when it first vaporises from a dry ice machine, but CO2 emissions are invisible to the human eye. According to www.unep.org, one tonne of CO2 occupies a cube the size of a three-story building: 8.2m x 8.2m x 8.2m (27ft x 27ft x 27ft). One tonne of CO2 is how much we are each responsible for emitting per month, on average in the UK. 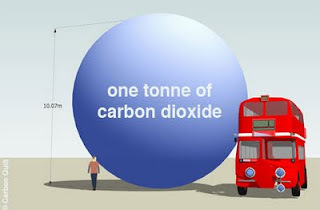 The 270kg of CO2 my CanSaveCarbon challenge will take up about 5,000 cubic feet, slightly more than the size of a modern double-decker bus (dimensions). 270kg of CO2 is the amount generated by driving 1,000 miles (@ 50mpg). For some interesting interpretations of what a tonne of CO2 looks like, have a look at CO2cubes. And don’t forget to donate or sponsor me! All proceeds to the Snowdonia Society.